Laurie Ruberg, far left, joins the People to People delegation of science educators. 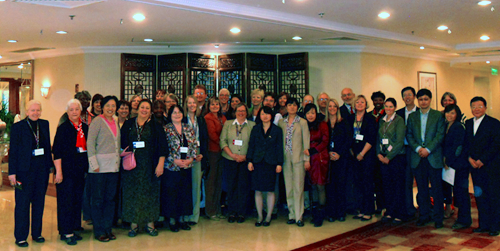 Dr. Laurie Ruberg, associate director of the Center for Educational Technologies at Wheeling Jesuit University in Wheeling, WV, and administrator of the NASATalk web collaborative created and administered by the NASA-sponsored Classroom of the Future, is part of the People to People Science Education Delegation to China: A Collaborative Community. Ruberg's delegation of science educators is visiting China to exchange ideas about promoting science education throughout the K-12 and university education system both in the United States and China. The trip began Oct. 13 and is taking the educators to Beijing, Guilin, and Shanghai. The educators are seeking information about programs and practices of Chinese teachers, administrators, schools, and science organizations. The group's goal is to better understand and participate in a world shaped by science and technology. Ruberg established a collaborative on the NASATalk site for participants to share articles, links, images, videos, and comments as they occur. NASATalk is a place where educators can share ideas, suggestions, success stories, and even frustrations about using NASA resources to enhance STEM teaching and learning.